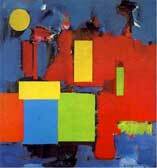 Hans Hofmann (1880-1966). His incredible imagery inspired his students as well as artists throughout the world. From his smaller works on paper to his larger paintings, they are all unique and powerful. 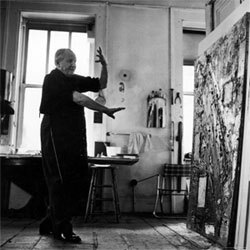 Hoffman has been called a Fauvist, Cubist, but is mostly referred to as a key artist of Abstract Expressionism. He used aspects of all these styles to create his own personal style. Hofmann’s famous push pull theory, a culmination of many of his ideas, describes the plasticity of three-dimensionality translated to two-dimensionality. Shapes, colors, lines, calligraphic squiggles, and use of space always echo the reality found in nature, but its structure rather than its appearance. In his search for the real (as he titled his book, “The Search for the Real and Other Essays” ) Hofmann produced a new type of landscape, one that is composed, not of trees and land, but of the tension between its space, form, color and planes. 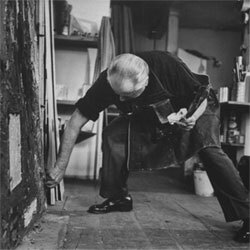 The key to Hofmann’s paintings is his passion for nature, whether perceived on location, from memory, or imagination. He incessantly probed natural elements, focusing on volume, and geometric forms in positive and negative spaces. It was the object, he said, that creates the negative or positive space, not, as traditionally conceived, that an object is placed in a space. If an object creates space, then it is light that creates form. Similarly, light makes color in nature, but color creates light in painting. 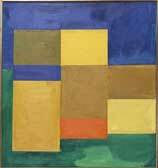 Hofmann’s life, physically and aesthetically, spanned from Post-Impressionism to the New York School. 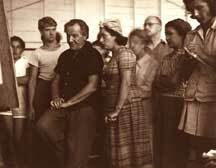 He socialized with the likes of Picasso and Matisse, and numerous other major artists in each generation, including the Abstract Expressionists, while exhibiting in prestigious and avant-garde venues. His work was generally well received, but he was never a leader of a particular movement. Hofmann was known as a synthesist because he brought together traditional methods and avant-garde concepts concerning the nature of painting, largely based on Cezanne, Kandinsky, and Picasso’s Synthetic Cubism. Because teaching dominated much of his creative life, his art was often critically measured against his theories. With his European sensibilities and his newly adopted American spirit, it needs to be remembered that Hofmann’s work exemplifies a fusion of multiple aspects of 20th century art.